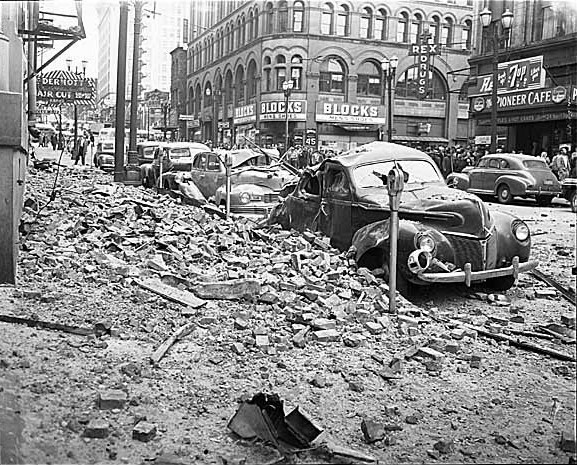 The Structural Engineers Association of Washington was incorporated in the State of Washington in 1950, one year after the 1949 Seattle Earthquake prompted a group of engineers to meet to discuss the resulting damage. This group, after learning of the difficulty the Seattle Building Department was having locating structural engineers available to help determine the extent of structural damage to buildings, determined to gather all the structural engineers of the city together to institute a calling service. The first meeting of the group to be known as the Seattle Earthquake Study Group was held May 10, 1949 at the University of Washington's More Hall. Within the study group, the Code Research Committee was formed to research the various building and earthquake resistant codes with reference to the ultimate adoption of one of them by the City of Seattle and by the State of Washington. By June of 1949 a roster of 28 engineers had been compiled. Each of these men had volunteered to act on call from the Building Department in the event of emergency or disaster. Although all had served on one or more of the various earthquake committees, the group had not yet met as one body. Talk began of organizing as a Structural Engineers Association similar to those formed in California. Organizational meetings followed over the course of several months, drafting a constitution and setting a dues structure. Finally, on April 22, 1950, the Articles of Incorporation were accepted by the State of Washington and SEAW was official. Today the statewide organization is divided into four chapters; Seattle, Southwest, Spokane, and South Central - each of which operates independently under its own board of directors. Representatives from each board serve on the Statewide Board of Trustees. Providing a forum for structural engineering issues through regular technical meetings. Providing continuing education opportunities through production of seminars and workshops. Participation in local and national code advisory/development processes.